KashFlow lets you record your digital service transactions, so that you will be able to create a VAT MOSS return for HMRC. Record your participation in the MOSS scheme. Allocate or set existing sales codes as digital services. If you’ve registered for the MOSS scheme you can tell KashFlow. 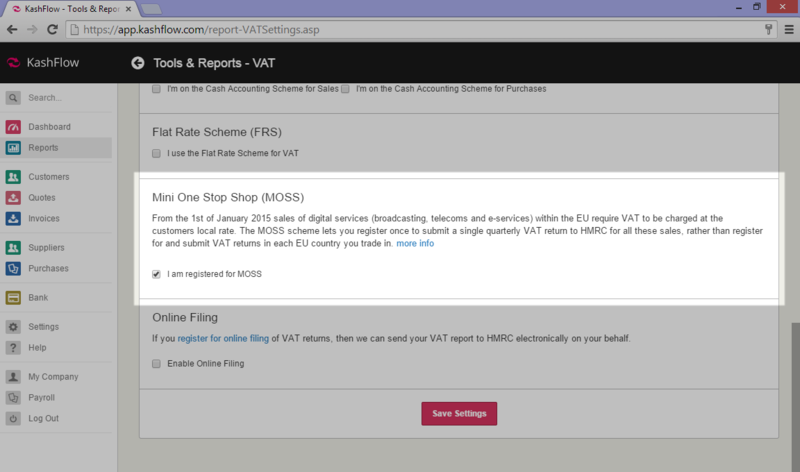 This will enable, in the future, the VAT MOSS return to be downloaded and submitted to HMRC. Simply go to Settings > VAT Settings and scroll down to “Mini One Stop Shop (MOSS)”. You can record your customers’ country on the billing and delivery addresses provided in their profile within KashFlow. Using this information you will be able to report your VAT MOSS return to HMRC. Click the customer you want to edit. 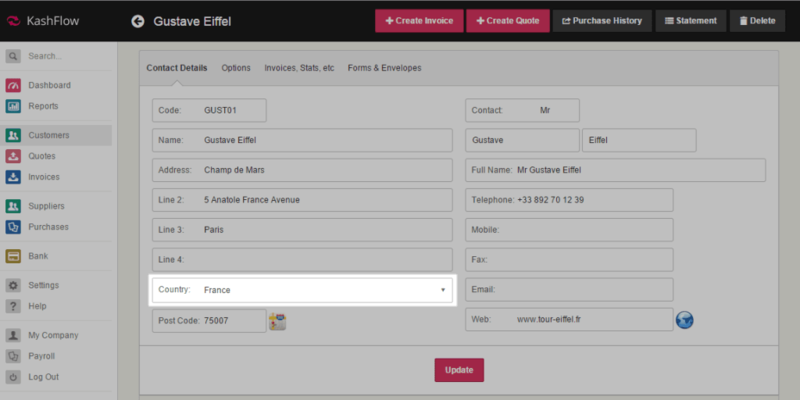 On the contact details, click the new option for “Country” and select the country. Please note, VAT MOSS will consider customers who are defined as being with the EU via the country specified on the “Contact Details” tab. You must ensure you have not selected “This customer is VAT registered in another EC Member State or” from within the “Options” tab on the customer profile. Next time you create a quote or invoice, the country will be automatically added. If you have an existing invoice, you can update the address directly on the invoice. In order to report correctly the VAT due, you can mark your sales codes as“digital services”. Navigate to Settings > Sales Codes. If you do not already have a sales code to allocate digital services too, create one here. Now sales of this code to other EU countries will not be included on your normal VAT return. 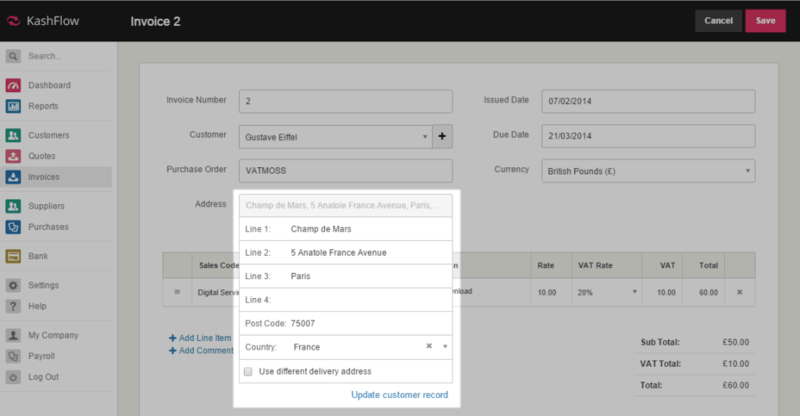 When you add a digital service line to an invoice you will need to add the correct VAT rate to that line. You can edit your VAT rates from the VAT settings screen. 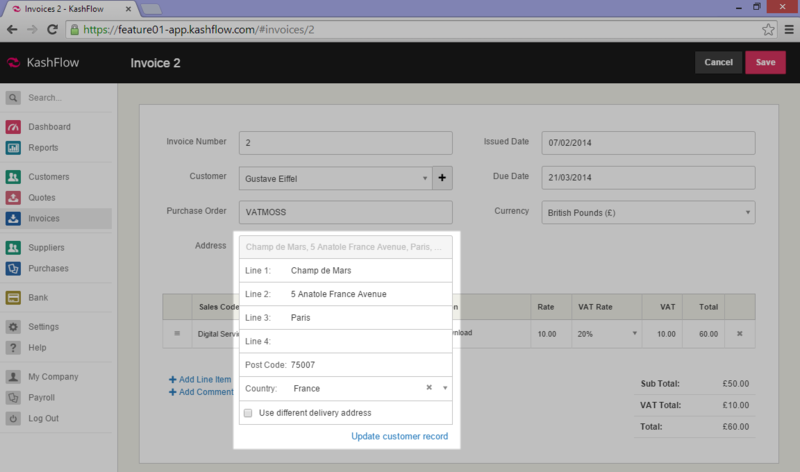 See how to create a VAT MOSS report in KashFlow here.